A childlike singalong written in the music hall tradition, All Together Now was written in the studio for the Yellow Submarine film. Paul McCartney came up with the idea for the song and wrote the verses and chorus, while Lennon contributed the 'Sail the ship, chop the tree' middle section. 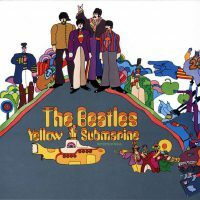 All Together Now features during an animated sequence in Yellow Submarine, and again towards the end of the film, introduced by The Beatles themselves. It's really a children's song. I had a few young relatives and I would sing songs for them. I used to do a song for kids called Jumping Round The Room, very similar to All Together Now, and then it would be 'lying on your backs', all the kids would have to lie down, then it would be 'skipping round the room', 'jumping in the air'. It's a play away command song for children. It would be in G, very very simple chords, only a couple of chords, so that's what this is. There's a little subcurrent to it but it's just a singalong really. A bit of a throwaway. McCartney was delighted when the song became a popular terrace chant at football matches shortly after its release in early 1969. Jazz musician Paul Horn remembers him singing it in India; instead of 'H, I, J, I love you', he is said to have sung 'E, F, G, H, I, jai Guru Dev' in honour of Maharishi's spiritual master. I put a few lines in it somewhere, probably. The Beatles completed the song in a six-hour session on 12 May 1967. In the absence of George Martin, the song was essentially produced by McCartney with assistance from engineer Geoff Emerick. It took the group nine takes to get right. They then added a number of overdubs, including ukulele and harmonica, both played by John Lennon. Thanks for that. All corrections and extra info are always appreciated. How awesomely catchy is this song? The Beatles were/ are awesome. Although Lennon sings the “Sail the ship…” part, that doesn’t necessarily mean that he wrote it. Is there any concrete evidence that those lines were his lyrical contribution? Is there any “concrete evidence” that McCartney wrote the chorus and verses other than he sings them or he said he did? There’s a bicycle horn or something in the mix there as well, that should probably be noted. Joe? There could well be, but unless I know who played it I’ll probably leave it out. Probably that horn is the plastic sax. Walter Everett confirms this, but didn’t mention the player. George played a second Acoustic guitar not John. and also one of the most fabulous count-offs in film history one, two, three, FAWR! i love john and paul and ringo and george. Shouldn’t that read “a-fix it, to keep his MIND from wandering!”? it must be John playing that horn, because of its occurance, don’t you think so ? Like many Beatle songs, I liked this one from the first time I heard it. All Together Now was one of the last Beatle songs I heard (never heard it before I bought Yellow Sub Songtrack in ’03). Now it is being used in some commercial and is probably more widely recognized today than it was 20 years ago. At the very end of the song, before the final honk of the horn, there is a spoken word. Any guesses? Paul fluffs his line and says olange instead of orange!! Can’t hear that fluff at all. What is the cartoon character that is shown when Paul sings “all together now” in his out there tour? Probably a little late but you have George and Paul playing acoustics and John playing harmonica on one track in another thread to this song. I think this would be more than likely than John overdubbing harmonica then overdubbing ukelele. Also I’m curious to know where you got the info that John played ukelele, Joe. By the way I think this is an amazing site, Joe. I always hear the line “Pink, brown, yellow, orange and blue I love you” as if it was sung by Ringo, for some reason. Maybe is because the nasal tone, the “olange” mistake and its slightly out of tune melody. Or maybe I just want to hear that. I think there are more people on backing vocals, Mark Lewisohn said that. I’m sure there’s a washboard on the record, you can hear it in the left channel from 00:30. I am not hearing a washboard really.. I mostly hear the second acoustic come in and out, Johns maybe?? Ringo’s drums (sounds like brushes to me on a plastic snare drum head) into the chorus. I also hear a random tambourine in the backing vocal track. I will one up whomever mentioned that it was George playing sax because I wonder if it was Brian Jones… he was playing sax on Satanic sessions during this, as well any number of other Rolling Stone members on back up vocals. After all, John and Paul did sing on their track(s) We Love You and I hear John singing on the “Sing This All Together, the ‘Open our heads let the pictures come /And if we close all our eyes together/Then we will see where we all come from'” refrains. Who knows? Also I forgot to mention, wasn’t Mick singing on Baby You’re a Rich Man (I only hear him on one line) just a day before this at Olympia? Pretty sure that’s where Satanic was mostly recorded at the same time. Where was Baby You’re a Rich man recorded anyways? So this track was recorded before the release of Sgt Pepper ? I thought it was produced after ? Of course Lennon wrote the middle eight “… Sail the ship, chop the tree, skip the rope, look at meeee”. Reason 1 being that they mostly sang the parts that they contributed to songs, especially later in their career (Rubble Soul on). Secondly, it is pure Lennon, in the same vein as his lyrics in Hey Bulldog! anyone know the name of the artist on the cover version of “all together now” airing in the latest Kohl’s TV christmas advertisement in the U.S.? Yeah, the band that Dow the cover of The Beatles song on the Kohl commercial airing currently is called Rabbit! “Can I take my friend to bed?”…Paul slipping in a bit of a naughty line there in this silly song. Yep, can’t use this song because it has kids singing “can I take my friend to bed.” Darn pity. That blows it for 95% of applications with kids. Should be commented on more frankly here, folks. Enjoy this catchy, fun number. Love the bit in the film “Yellow Submarine” where The Beatles appear themselves. Is it true this was originally considered for the worldwide broadcast before “All You Need Is Love” was chosen? Marc Turner – No McCartney contribution was Your Mother Should Know for the Our World broadcast and they wisely chose All You Need is Love instead. When I took my Beatle-loving family to see Paul McCartney live a few years back, our poor seven-year-old son, overwhelmed by the noise, felt compelled to cover his ears and escape into a book…only to resurface one time – to the irresistible strains of All Together Now! It’s strange, but when I saw him in 2014, this is the song that made the biggest impression. I would have to look at a set list to remind myself of most of the others. It was a typical show of that era, I understand, although it’s the only time I’ve ever seen him. He played Beatles songs, he played Wings songs, he played solo songs. Some were very old, some were new (one of them may even have been, literally, “New”). All Together Now was in no way the best composition I heard that night. But I liked the feeling it created. I was thinking to myself, this is something he tossed off when he was a young man at the peak of his powers, around the same time he was writing Hey Jude and all those other indelible favorites, and here we are almost 50 years later, and he has thousands of people singing along with it. He sang it with such sincerity that night, and people responded to that. it seemed we were “all together now,” all these people who will never meet even though most of them share a city. I had never paid All Together Now much mind before that, but it will always be a special one for me now. Not one of the better songs in the Beatles’ catalog.